We’re proud to be supporting the charity Cancer Research UK over the next year. 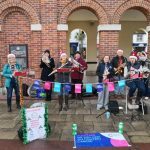 We’re starting our fundraising by busking around Bournemouth, Christchurch and Poole this December. We’ll donate half of the money we raise to Cancer Research UK which is a charity close to many people’s hearts. Come and see us play! We’ll be entertaining you with Christmas carols while you do your Christmas shopping at supermarkets and shopping centres across the area. And for those of you who leave your present-buying until the last minute, don’t worry – we’ll be playing right up until Christmas Eve! 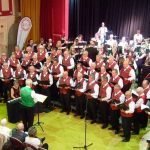 We kick-off the festive season on Sunday 9 December at Tesco in Branksome, Poole, and finish on Christmas Eve at Tesco in Tower Park, Poole. The latest figures show that 1 in 2 people are expected to get some form of cancer in their lives*. And so most people know of someone who has been affected by the disease. We’re proud to be able to contribute towards the charity’s research in the little way that we can. We’ll be raising money for Cancer Research UK over the next year through events and fundraisers.